One person has died and 23 rescued from the building that collapsed in Malindi on Friday. 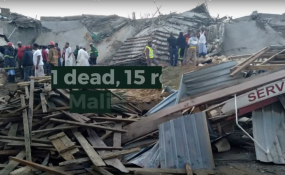 One person has died and 15 so far rescued from the building that collapsed in Malindi on Friday. Teams from the Kenya Defence Forces, National Police Service, Kenya Red Cross and county fire brigade are at the scene to comb through the debris in bid to save those trapped under. The eight-storey building collapsed on several nearby residential houses and a petrol station. Even though the eight-storey building was under construction, residents said there were people who lived in the lower floors. "We are still searching for more people although we are cautious to avoid further disaster bearing in mind there are explosive substances such as petrol, kerosene and gas at the petrol station," said Red Cross regional coordinator Hassan Musa. Mr Musa said they are searching for two people who can be heard calling out for help. Mr Kibandi Kipanga, a laocal resident, said he received a distress call at around 5am that a building had collapsed and debris had fallen on a nearby petrol station where they had parked their Tuk Tuks, the three-wheeled motorised vehicles used as taxis. "I rushed to the scene together with my colleagues to rescue our property but during the operation, we heard people screaming and we managed to save a woman whose leg was injured," he said. Police had a rough time controlling the crowd that had gathered at the scene to witness the operation and had to spray water on them using the fire engines to disperse them. The survivors have been rushed to Malindi Sub County Hospital for treatment. Kilifi County health minister Anisa Omar said three victims have been discharged while one has been taken to theatre. The rest suffered minor injuries.